Consumer electronics maker Portronics has launched its new Charge Clamp, which is a dual purpose car accessory. Portronics Charge Clamp is essentially a wireless mobile charger which also acts like a car mobile holder that enables users to keep their smartphones in case they are using them while driving. 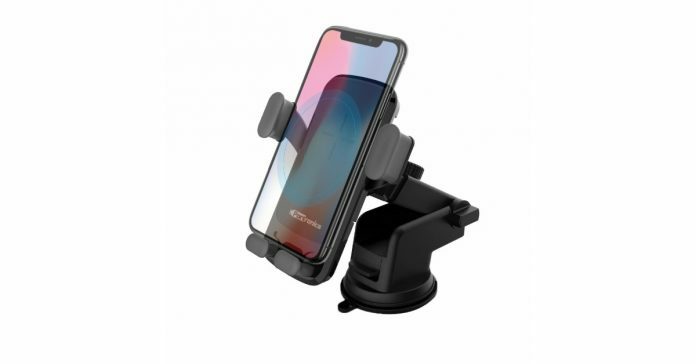 The new accessory by Portronics looks like an ordinary car mobile holder that can hold a smartphone that is up to 9-inches in size. Portronics Charge Clamp also charges the device simultaneously. The accessory comes with three movable hinges that allow the smartphone to be held and tilted at whichever angle the user likes it to be in. There is a latch at the bottom of the Charge Clamp that allows it to securely mount smartphones firmly. This also ensures that the smartphone of the user doesn’t accidentally fall off when the car is being driven on bumpy roads. The charger weighs 245 grams and the company has claimed that it protects the user’s smartphone from a current surge, overvoltage, over-temperature protection as well as summer heat. Portronics Charge Clamp supports Qi-enabled wireless charging and is compatible with Android as well as iOS devices. The devices that can be charged wirelessly include iPhone 8, iPhone 8Plus, iPhone X, Samsung Galaxy Note 8, Samsung Galaxy S8, Samsung Galaxy S8 Plus, Samsung Galaxy S7, Samsung Galaxy S7 Edge, Samsung Galaxy S9, Samsung Galaxy S9+, Samsung Galaxy S8, Samsung Galaxy S8+, Samsung Galaxy S7, Samsung Galaxy S7 edge, Samsung Galaxy S6 edge+, and Samsung Galaxy Note 5. If you wish to charge your device wirelessly, all you have to do is connect the USB cable from any car charger to the Charge Clamp. The company has further said that the Charge Clamp can charge a smartphone at a maximum output of 10 watts and has a maximum distance of wireless charging of up to 8mm. The new Charge Clamp by Portronics also supports wired charging. The Portronics Charge Clamp is priced at Rs 2,499 and is available at various online and offline stores in the country. The device comes with a warranty that lasts for 12 months.